French scholar and Orientalist; born at Dieppe May 13, 1638; died there April 21, 1721. After studying at the Sorbonne he joined the Congregation of the Oratory, in the library of which he studied Oriental works and manuscripts. When a certain Jew was condemned to the pyre at Metz on a blood accusation, Simon wrote a strong opinion in protest (1670). He translated Leon of Modena's "Historia dei Riti Ebraici," etc. (1674), and wrote "Comparaison des Cérémonies des Juifs et de la Discipline de l'Eglise" (1681). His chief work, however, was his "Histoire Critique du Vieux Testament" (1678), practically the first introduction to the Old Testament written. 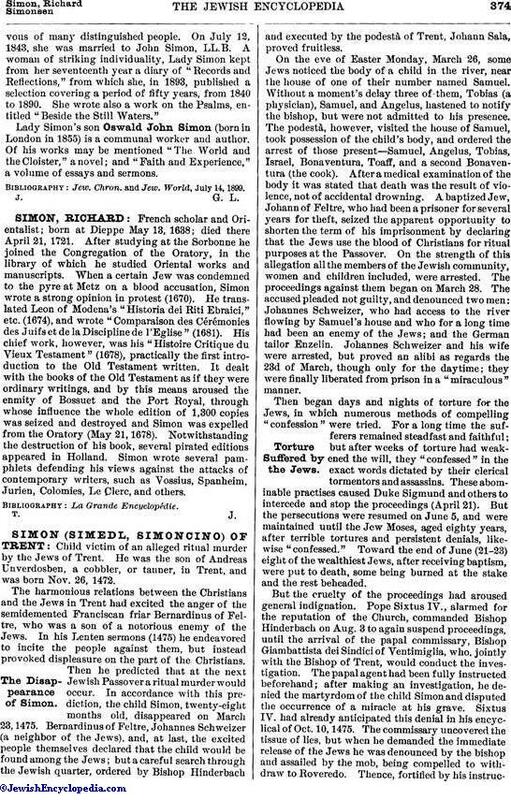 It dealt with the books of the Old Testament as if they were ordinary writings, and by this means aroused the enmity of Bossuet and the Port Royal, through whose influence the whole edition of 1,300 copies was seized and destroyed and Simon was expelled from the Oratory (May 21, 1678). Notwithstanding the destruction of his book, several pirated editions appeared in Holland. Simon wrote several pamphlets defending his views against the attacks of contemporary writers, such as Vossius, Spanheim, Jurien, Colomies, Le Clerc, and others.